When EBEW posted that today would be thrift day, I had two conflicting thoughts. First, "FABULOUS. This theme is SO ME. 3/4 of my wardrobe is thrifted. I have to remember to do this EBEW." Then I thought, "oh. 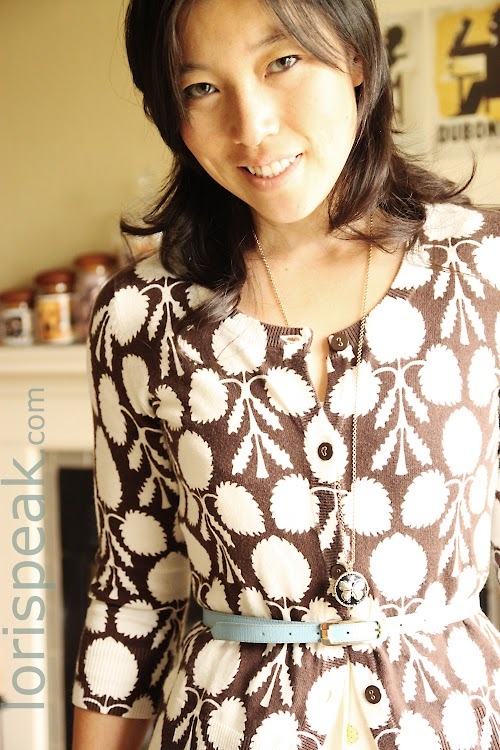 maybe it's not a special theme for me, since every outfit I wear incorporates thrifted pieces." But of course I gotta do it! In fact, I've thought about hosting a reader feature of fashion bloggers wearing their thrifty outfits. But, I didn't know whether there would be enough interest. On a side note, if you are interested in getting into thrifting, check out my Guide to Thrifting Shoes, and What to Wear While Thrifting posts for some tips. I wore this earlier this week. The dress/jumper, jacket, and necklace are thrifted finds. I love the cute little anchors on this dress. And although bright colors are my usual playground, navy-colored clothes take up a large spot in my closet. In fact, I like navy more than black. Black washes me out and makes me look super goth with my pale skin and dark hair. Not one to forgo color completely, I thought the pop of the red necklace was great compliment to the nautical feel of the outfit. The blazer made the flirty jumper more work appropriate. I also added a smidge of length by wearing a lace-fringed slip underneath. When I thrifted this sweater, my husband was skeptical. In his mind there wasn't an outfit that could work with this pattern. So what did I do? I paired the pattern with more pattern. duh. Pattern + pattern = FUN. Y'all should definitely try it. Mixing patterns makes people think think you're some kind of style savvy chica... or something. I used to be afraid of mixing patterns. I'd gaze at Anna Sui runway collections in awe, and wonder how she knew such intricate patterns could go together. How would I know what patterns would work together? Honestly, I never really thought through my tactics before jumping in, but I think I've picked up on a few tips. Tune back in over the next few days for a Pattern Primer Post (always loved me some alliteration). In this outfit, I thrifted the dress, the sweater, the belt, the necklace, and the shoes. BAM! Yah, it's the blue plate special of outfits. Lovely thrifted finds! I'm glad to read you are as addicted as I am. Love your pattern pattern mixing! oh that dress is super fun! and i love how the necklace pops against the navy!! You are too cute! 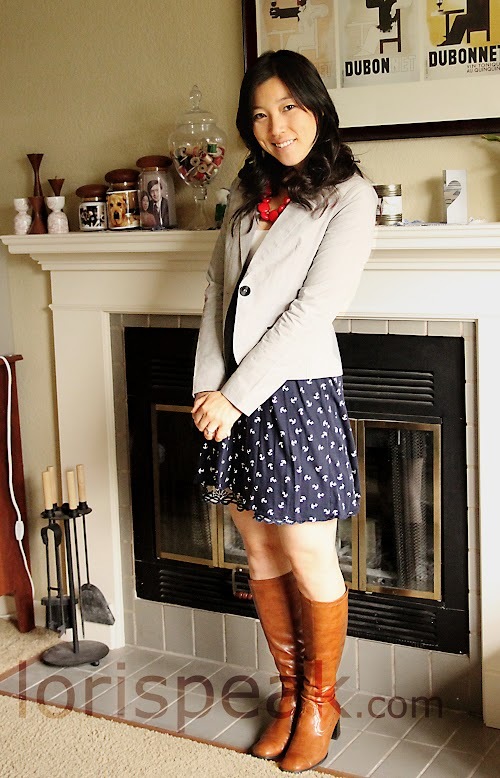 I am in love with your anchor dress, what an excellent thrifty find and it looks grown up with a blazer. I am also a thrift addict, about 80% of my wardrobe is second hand or vintage. One of my fave thrift finds is a brand new pair of Frye boots for $10 at Goodwill worn here (in the kids' section, no less). I could hardly believe that they were my size. It's treasures like these that get me excited about the hunt. Love your blog and style! I'll be keeping up with you on bloglovin'. 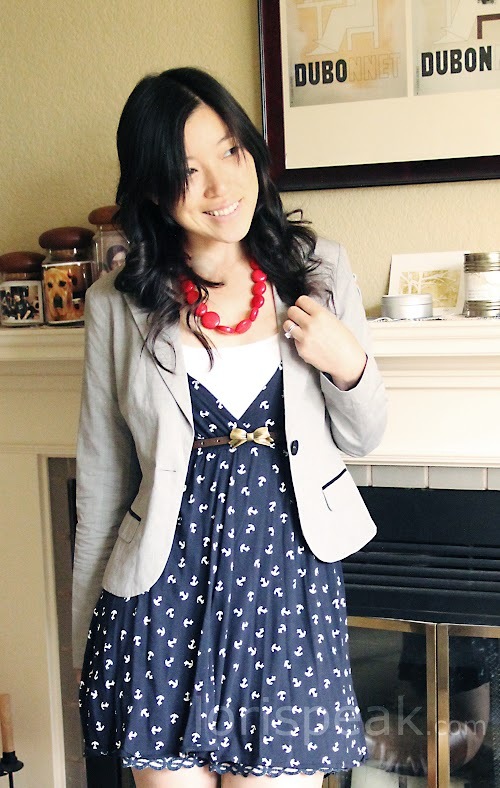 Omigosh, that anchor print dress is so friggin cute! It works a sweet treat with the bow belt. You look so cute in both outfits Lori. I'm in awe of your ability to pull off socks with kitten heels-I've thought about doing that myself but didn't have the guts. 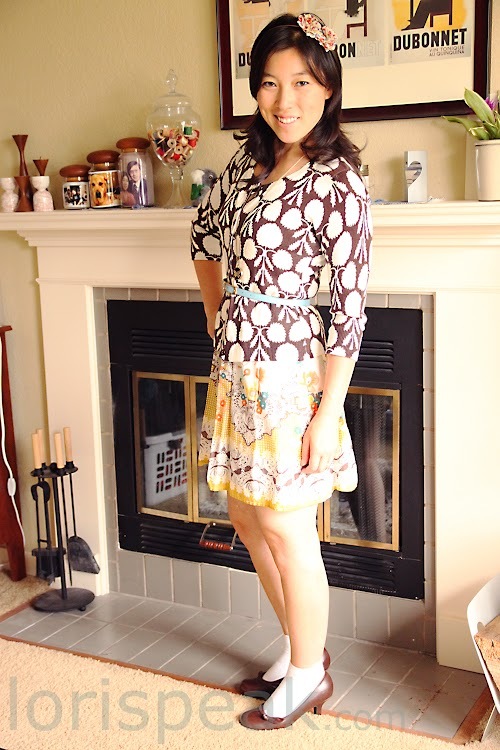 Your pattern play outfit is incredible- I love it, truly and completely. I love the potential for great pieces with thrifting- sure there's stuff I don't wear much, but it can just go back someday and I'll replace with something else that's fun!! Love that dress so much and those patterns work so well together, great look! Thanks for the comment on my most recent post :) Consider me your newest follower...love your blog!